When I became a customer of the 23andMe personal genomics service back in 2008, I remember the sense of awe I had when I opened up the raw data file for the first time and looked at the actual A’s, G’s C’s and T’s of my genetic makeup. In reality it’s only a tiny portion of it since 23andMe assays 600,000-odd “single nucleotide polymorphisms,” or SNPs (now close to a million with their v3 chip). SNPs are locations in the genome where individuals differ from one another. SNPs (pronounced “snips”) are interesting because they might help explain in part why my personal traits and health have developed the way they have – how I might respond to certain drug treatments, why my eyes are brown, or whether I am a carrier of known Mendelian disorders, for instance. 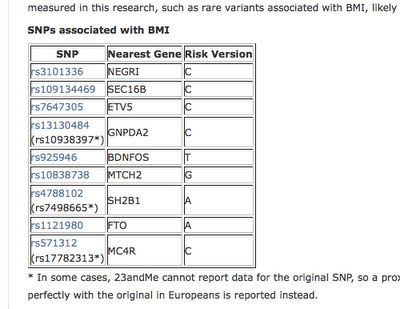 More and more new research arrives every day, attempting to link SNPs to every conceivable health condition and trait. 23andMe does a good job of providing interesting and carefully-researched reports for their customers, available on their website, and tailored to your personal genotype. They sift through the flood of research data and determine what is really worth your time to consider. They also maintain an informative blog that tracks breaking developments that might eventually make it into their official reports. Those of us who are more adventurous, however, and perhaps better-schooled in the science behind personal genomics, can outgrow 23andMe’s filter. We wander to the scientific literature and other technical online resources where there is a lot more data, much of it preliminary, to explore. Such information can tempt one to jump to erroneous conclusions. But I understand this environment and I’d rather decide for myself. This is the situation I found myself in not long after becoming a 23andMe customer. 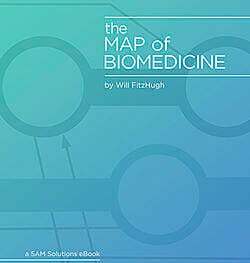 I discovered Mike Cariaso’s SNPedia.com, for instance, and ran my data through his Promethease tool – and I realized there was a lot more information on SNPs in the literature than 23andMe was showing us. Also, I became a more technical reader of the 23andMe reports, and now routinely follow up their references and go back to the original journal articles to understand why they draw the conclusions they do. But there is one problem with all this Web wanderlust – once you leave 23andMe’s website, you must look up your genotype at each SNP on your own if you want to see what impact a particular finding might have on you. This can get quite tedious – especially for journal articles that mention batches of SNPs at a time. To the eye (and my memory), it’s not clear which SNPs are on the 23andMe chip at all, since they assay a subset of the known frequently-occurring SNPs. This led me to a rather straightforward idea – why not build personal genomics smarts right into the web browser? That way, the browser could enhance web pages that mention SNPs and show you relevant information without you actually having to break your reading flow and go look up genotype information. A browser extension can do this, and so SNPTips was born. SNPTips is a Firefox browser extension that links to your 23andMe raw data and pre-processes web pages as they are loaded, adding color-coding and tooltips to SNP IDs that are mentioned in web content. 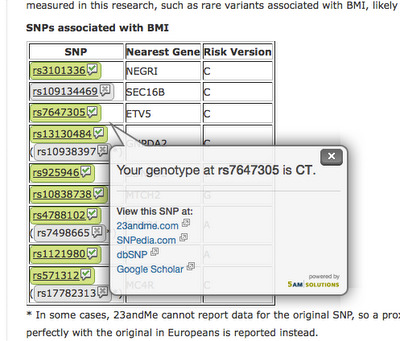 If you simply hover your mouse cursor over the SNP RS number, your personal genotype at that SNP is displayed. SNPTips also adds a little icon next to the ID – clicking this icon brings up a balloon with smart links to other web resources, including SNPedia, Google Scholar, and NHGRI’s dbSNP – so you can delve deeper with a single click. Looking up each of these SNPs one at a time is a major pain, and a true impediment to getting value out of 23andMe raw data – switching windows, logging in, searching, etc. With SNPTips, a simple mouse gesture is all that’s required, without even losing your place as you read! I’m excited about our future plans for the tool as well (additional browsers, other personal genomics services, for instance) – stay tuned here (and follow @SNPTipson Twitter) for updates.